We are here in Klamath Falls, Oregon now. We started the move July 1st and I was making runs all July. The old place was officially vacated July 31st. August was the slow unpacking of boxes and the beginning of several furniture building projects. I have built 6 bookcases; 2 of them 40 inches tall, the other 4, 70 inches tall. I still have a number of things to build like the DVD cabinets that will hold our 1000ish movies and TV shows. I also have a lot of storage containers to build, think apothecaries drawers. Lot’s and lot’s of them. You can see why I haven’t posted in a while. I have made some upgrades to the shack, well the mobile, the shack is looking rather minuscule right now. I have absolutely no bench space for shop stuff or electronics. The station is occupying a puny 1 sq.ft. space across 2 shelves, but, I actually have an HF antenna outside! The MFJ-1982LP endfed is up. The feed point is about 15 feet up on the mast my 2m roll-up J-Pole is attached to and the rest of the antenna is supported by 2 31 foot Jackite poles and 20 feet up into the Ponderosa Pine in our front yard. So far 80 and 40 meters have been kind. The net controls have had to work me pretty hard, but I have been getting through. I have been heard as far away as Victoria BC Canada, La Jolla California, Somewhere in Wyoming, Utah, and Nevada. Not bad for 5 watts. 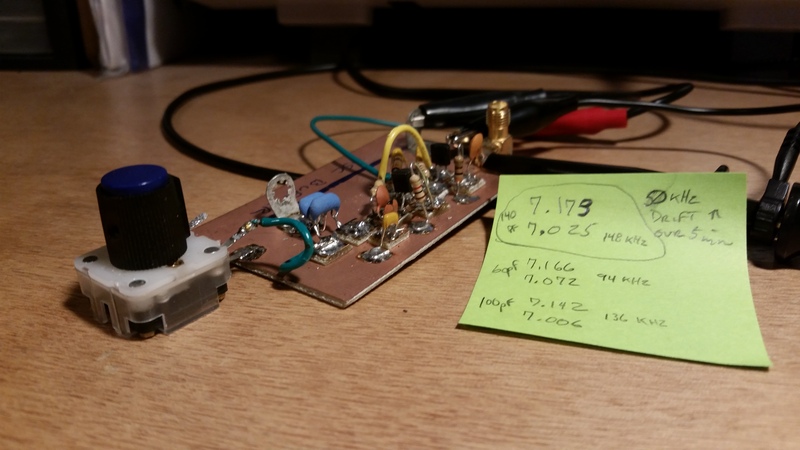 The power on the base, my Yaesu FT-817ND, needs a boost now that I am putting together a local NTS Net. I need to make the Local to Section hop on HF more reliably and not make control work so hard. The local net will be on one of the club repeaters. 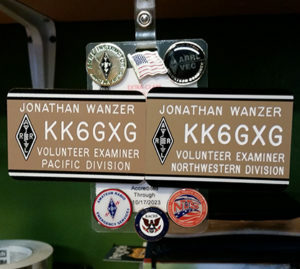 I have also moved forward by getting involved with a local active club, the Klamath Basin Amateur Radio Association. I have already done two events and a VE session with the club since we got up here. Also in the mix is getting started with the Klamath County CERT program. There is some early work on getting an ARES/RACES group together. All kinds of fun going on. Once we got up here I started work on the mobile. The Baofeng UV-5RE+ was not cutting it on 2 meters. 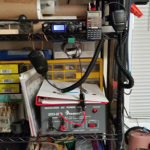 I upgraded from 5 watts with a crappy little antenna to 25 watts with a QYT KT-9800D dual band mobile radio and an ANLI DC-124H TriBand antenna. Much better performance. Also in the mobile, I installed a Uniden BEARCAT 980SSB Single Sideband CB and a Midland MXT400 GMRS radio. There is hardly any CB traffic up here, but surprisingly, there is quite a bit of GMRS traffic. 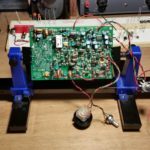 For a 2 meter base, I have been using one of the 5 watt handhelds attached to the homebrew 2 meter twin-lead J-Pole I built a while back. Now that I am getting hooked up with CERT, I think I should pull the J-Pole out of the PVC and use it as a portable roll-up. I also need a little more juice for poor weather conditions so a 2 meter base upgrade was in order. Another QYT KT-9800D mobile radio and a Diamond X50A dual-band base antenna should work nicely for VHF/UHF. Those will be incorporated into the station by the end of the week. As for the HF side of the station… I need to poke around for something around 100 watts, which will require an antenna upgrade too. The MFJ-1982LP is only rated to 30 watts. As long as I keep the power down I should be able to use it for a while. 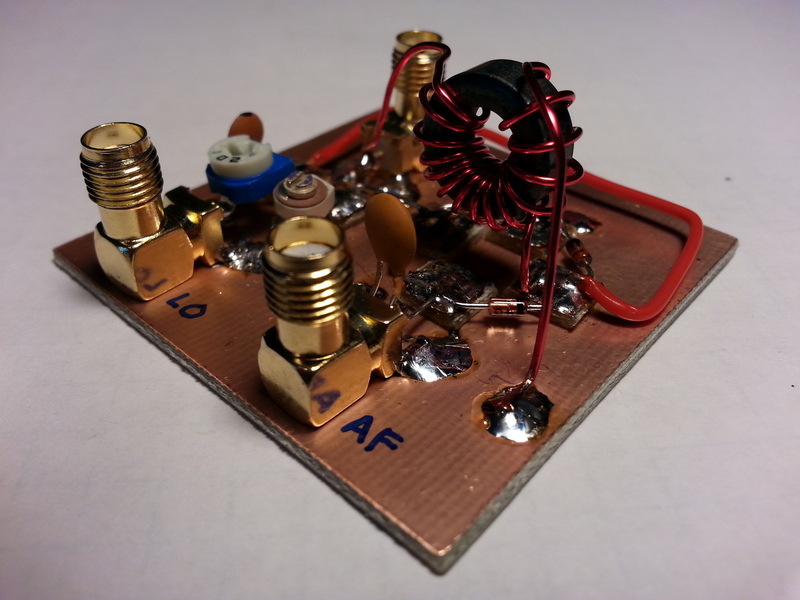 That will still give me a 6 db power gain over the 5 watts I am pushing now. Anything should help. The section nets are on 80 and 40 meters so I will need an antenna that covers at least 10-80 meters. 100 watts should be more than enough for my needs. Oh, one other thing, I finally got my Skywarn ID number, now I need to find a net for Skywarn. I haven’t found anything in southeastern Oregon yet. I’ll keep looking. Anyway, that’s the status update for now. Look for an NTS page to be added to the site soon. The move is most definitely on, things happened quickly and we put down a deposit on a rental house while we were up in KF two weeks ago! We have been packing since early April so most of our stuff, aside from consumables and the essentials, are packed. 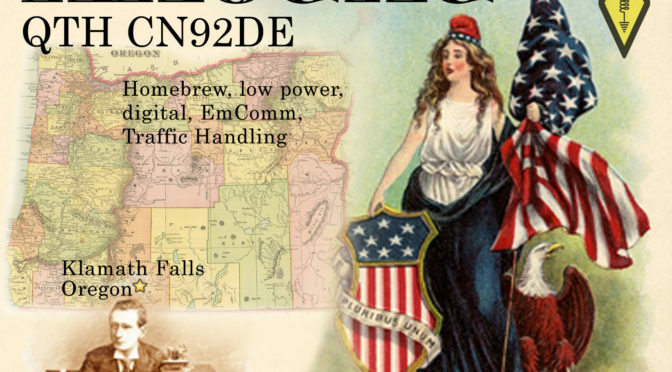 I will be making a number of runs up to the new house in Klamath Falls, Oregon (CN92de) beginning July 1st. 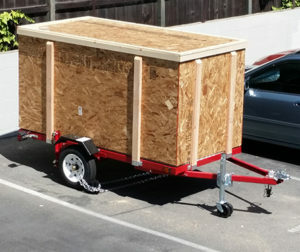 We decided to buy/build a trailer rather than rent a truck. The cost will work out about the same but in the end, we will have an asset, not just a receipt. 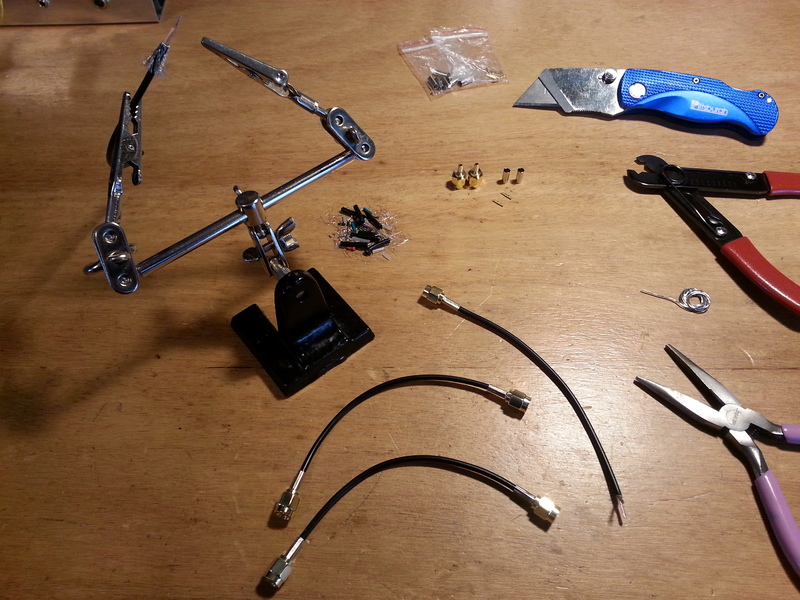 This weekend, June 24-25 is trailer build time, so another Field Day goes by unobserved… Sad about not getting the new FT-817 on the air for FD, but the move takes precedence. The good news for radio is that I have a place to set up a 136′ multi-band horizontal end-fed with the mast just a few feet away from the shack’s new location. 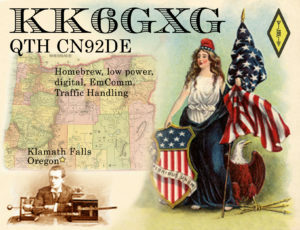 When I designed my QSL cards, we were already looking at relocation sites in Oregon so I designed a card for California and a card for Oregon with the intention that I would only have a couple of minor changes to make once we found a place. With any luck, in a couple of years when we find our permanent landing zone it will be in the same Grid Square. If not, it’s an easy fix. 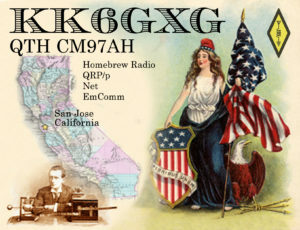 Since I design my QSL cards myself, I use VistaPrint for the printing. I get a high-quality stock and finish, it’s economical, and I maintain complete control over the printing. Another early prep purchase was my VE/Callsign tag. Moving to a new Division, I figured I would be a good idea to get a badge with the new division on it. I get all of my badges done by The SignMan in Baton Rouge, LA. I have nothing but great things to say about Rick. He does an excellent job and the customer service is top shelf all the way. I am not affiliated with the shop or Rick in any way, and I buy my stuff at the regular price, I just love the quality, speed, and work ethic. You will too I’m sure. I am hoping to get the FT-817 rigged up for mobile use in the next few days so I will be able to work mobile on 70cm, 2m, 6m, and 10m over the many long drives to OR and back. 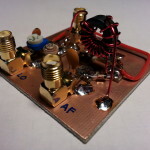 I will post frequencies on the contact page and in a sidebar element. Along with adding a Remote Pilot certificate to my FAA credentials, I added a General Mobile Radio Service (GMRS) license grant to my FCC credentials. The new license is WQZJ382. At present, I only have a single handheld GMRS radio (Garmin Rhino 120) but I have plans to add a Midland mobile to the vehicle and one at home once we get set up in Oregon. Most likely a couple of handhelds as well. 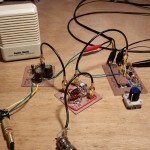 I am also entertaining the possibility of a repeater. I was fortunate to recently have been gifted a BitX 20 kit by a friend and fellow VE. The kit came from QRPkits.com some time ago, I believe at least a year or so ago. My intention was to build it for Field Day 2016. Sadly, while I was well on track to getting the radio built, 2 parts were missing from the kit. BS170 N-Channel MOSFETs to be specific. This put on the breaks for the final assembly and stopped me dead in my tracks with the finish line in sight. I have the parts waiting for me at Jameco will-call for Monday. Once I get them home, populating the remainder of the circuit board should take about an hour. Then its on to the initial tuning and getting the radio packaged up in its housing. I will do a full project write-up in the Projects section soon, but for now just an update. During the BitX build I ran into a small hiccough. 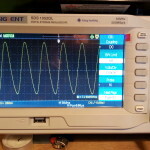 The testing at some point calls for the injection of an 11 MHz signal. 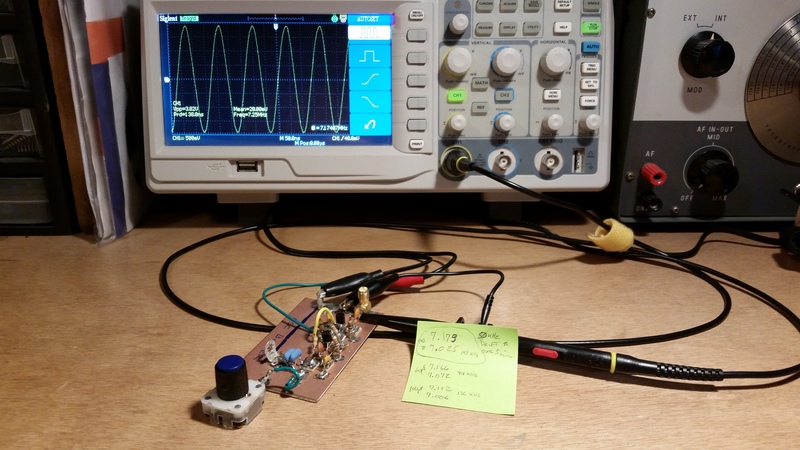 I would normally use my Lafayette signal generator but for some reason it’s on the fritz so I had to come up with another solution… build an 11 MHz signal generator. 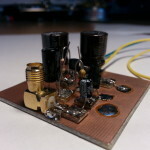 Off to HSC Electronic Supply for some 11 MHz crystals. This project will also get a write-up in the Projects section soon. 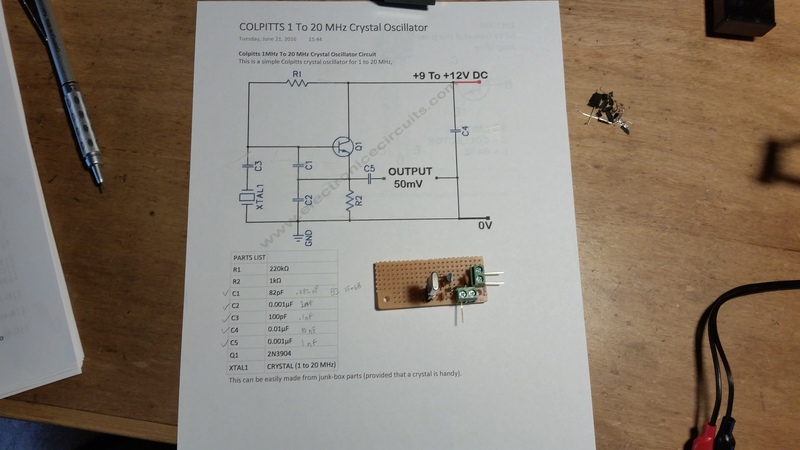 This one in in particular has a lot of use in checking unmarked crystals as long as they are between 1 and 20 MHz and is a great foundation piece for beginning builders. Before I got started on the BitX I was working on getting my Baofeng 2m/70cm HT on digital. I found a couple of designs for a homebrew TNC and set out to make that work. Because of the way the PTT key works on the Baofeng I haven’t been able to make the TNC work with the HT but it should work fine with my 40 meter QRPme.com Splinter II and the BitX 20. A full write-up post is coming on this one too. Look for all three of these in the Projects section for full details on the builds coming soon. As soon as the BitX 20 is up and running I plan on getting the Lafayette working again and get back to the Beach 40 DSB. Another Field Day has slipped through my fingers. I don’t plan on that happening again! That’s all for now folks, 72, 73, and good night! Today was a good antenna day. 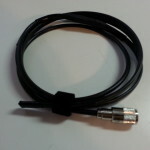 I finally got the PVC cover on the 40 meter helically-wound antenna I started back in April. I have been using the antenna without the cover as a test antenna next to the bench but it’s time to get it up on the roofline for some actual use. By “actual use” I am referring to the Beach 40 project that is back in motion now that I have a VXO that pulls more than 1.8 kHz of selectivity. 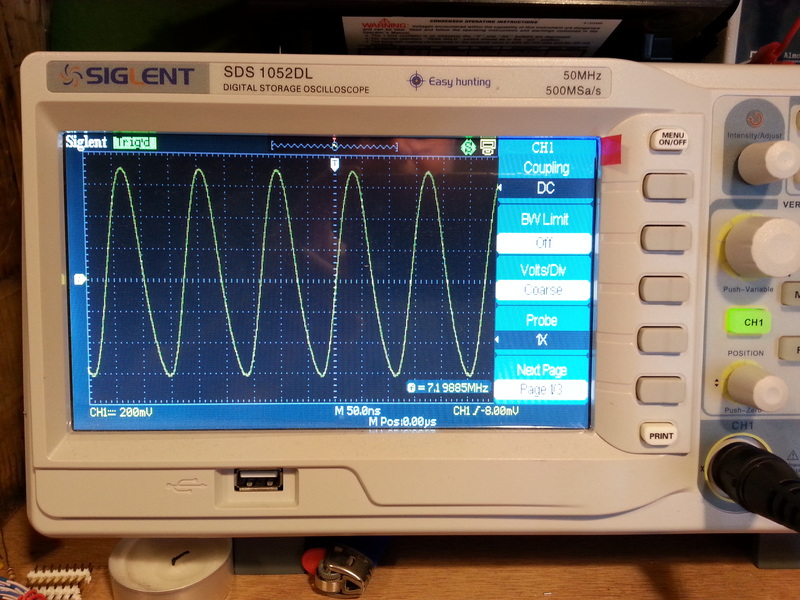 Yay 148 kHz selectivity! 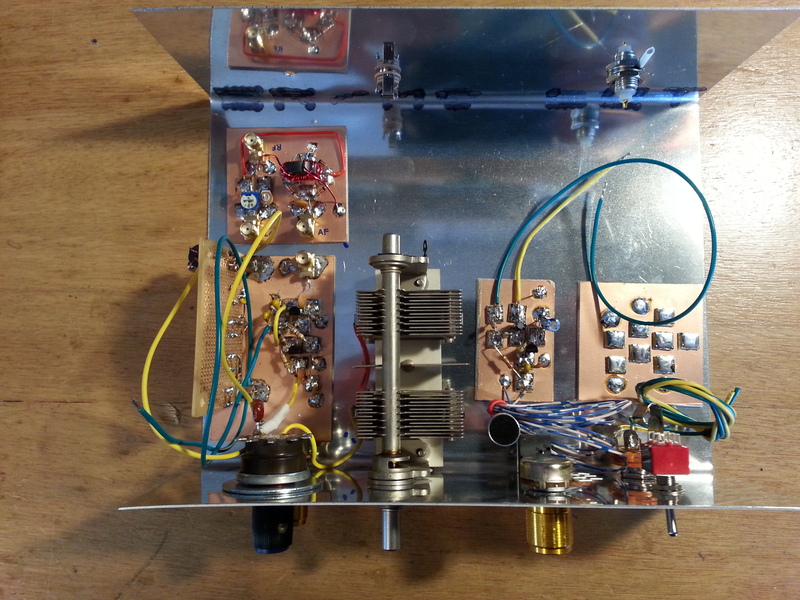 Now all I need to do is get the Tx/Rx switching working for the transceiver to be operational. 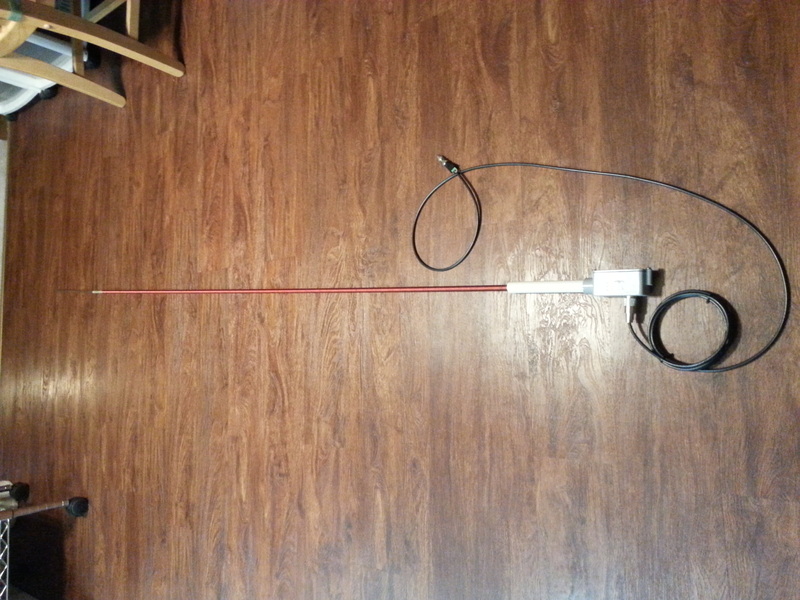 Another antenna project completed today is the 2 meter twin-lead J-Pole. This one was also waiting for a PVC cover so it could be mounted on a pole. 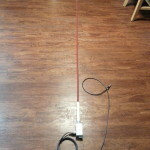 The original design was intended as a portable antenna but the twin-lead J-Pole on any frequency above 50 MHz lends itself well to mounted vertical use, it just needs a housing to keep it in the vertical position. 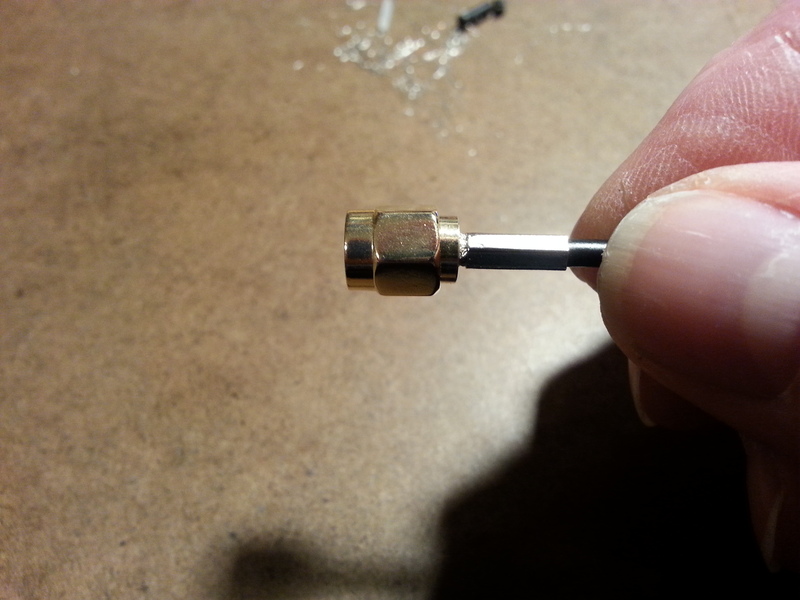 This little antenna works really well. On numerous occasions I have been unable to ping the local repeaters with my HT with the stock or aftermarket antennas for handhelds. 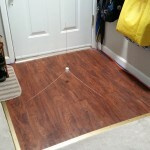 If I attach the twin-lead J-Pole I can actually get out and participate in the nets. With this antenna up in the air at roofline I should have no problems working any of the local repeaters including the packet and Winlink towers. The other antenna project today was a new-start. When the 2 and 40 meter antennas go up I also plan on attaching a 70 cm half-wave vertical with counterpoise. This one is an experiment. 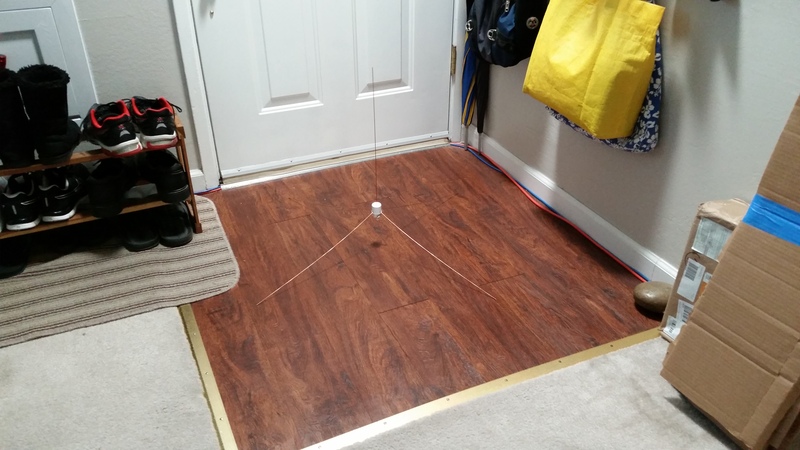 I originally planned on building a 70 cm full-wave twin-lead J-Pole, and I likely still will, but I wanted to see if I could make a vertical with counterpoise that works well. I may even mod this one into a full-wave vertical with half-wave counterpoise radials. Dunno. Like I said, this is an experiment. Another near-term antenna project, as-of-yet not started, is an aviation band twin-lead J-Pole set up like the 2 meter one. Being a pilot and mechanic, at some point I would like to have either a hangar at a local airport or a small strip at home to work on restorations, so it would make sense to have an AvBand radio in the shop. I have a Vertex Standard (Yaesu) HT for aviation VHF, it just needs an external antenna. I also have a few old radios salvaged from aircraft that would never make it back into an aircraft, but may be suitable for base station operations. 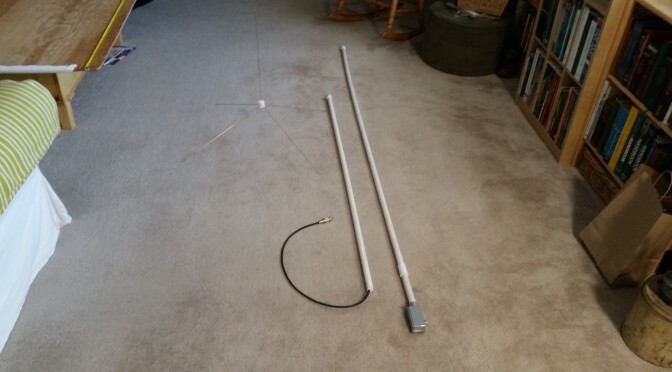 I have a number of other antenna experiment/projects in various configurations, in particular 2 m and 70 cm yagi and/or helical beam antennas suitable for satellite and moon bounce communication. But these are for the future. 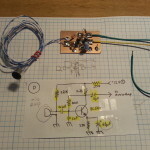 I also want to build some highly directional antennas for radio orienteering and high-gain narrow-beam antennas for really low power communications. 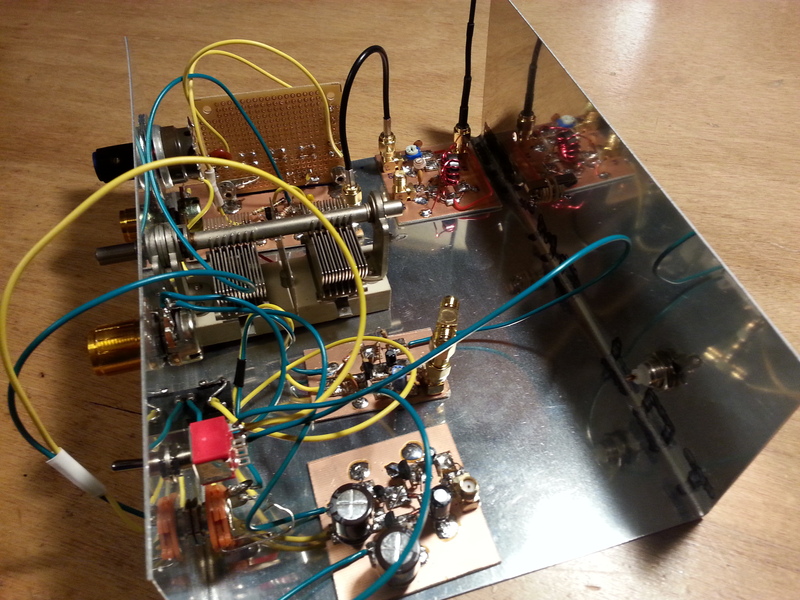 As for the “More” in the title, once I finish the 40 m transceiver I plan on building a 20 and 10 meter versions. 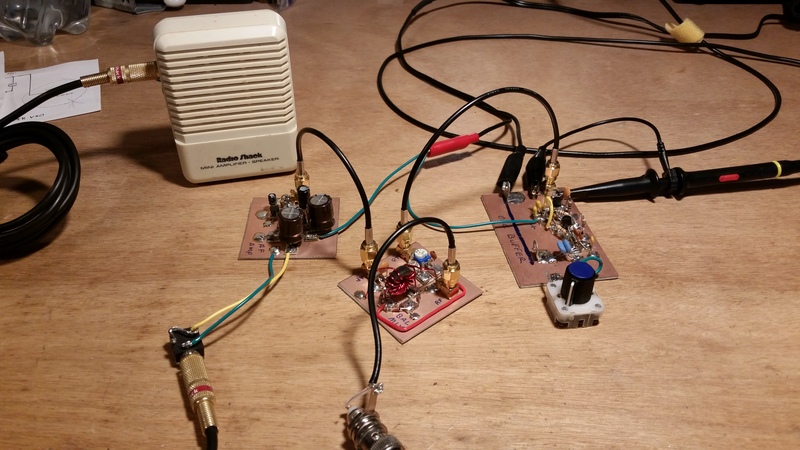 I also have an idea for simple low power beacon transmitters I want to play with. 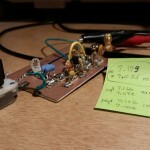 I also want to get set up for QRSS, WSPR, and APRS. Lots to do. One step at a time. The Beach 40 saga continues. My original VXO design, well… it stunk. I’m not sure why, but the best selectivity I could get out of it was only a couple of kilohertz, very annoying. 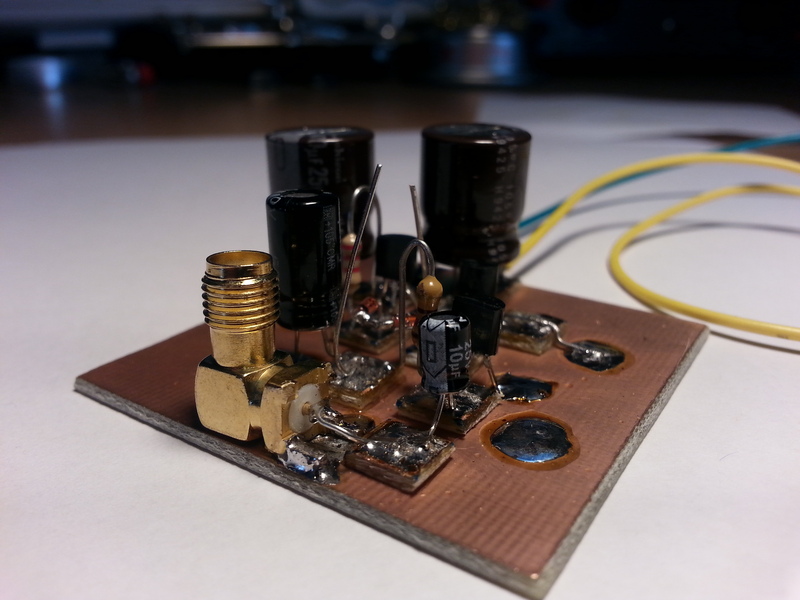 I have been working on a VFO design to get full band selectivity but in the meantime I came into some ceramic oscillators for 7.2 and 3.68 MHz. The best part is that I replaced the entire Super VXO section with a 140ρF variable capacitor and two ceramic resonators. 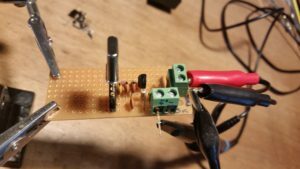 By placing the 140ρF var cap in series with the two paralleled resonators and feeding the output directly into the local oscillator buffer… Ta da! A working VXO. 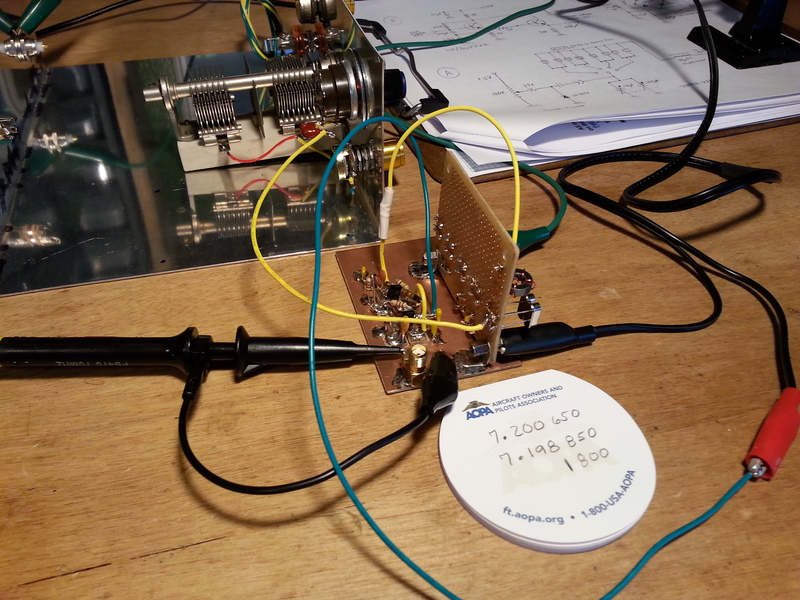 This time, instead of a few kilohertz the VXO pulls a full 148 kHz, from 7.173 MHz down to 7.025 MHz. It is certainly not the full band but it is a useable range. Over a five minute period I noticed a about a slow 50 kHz drift that eventually settled out to a point where it continued to float ±10 kHz. 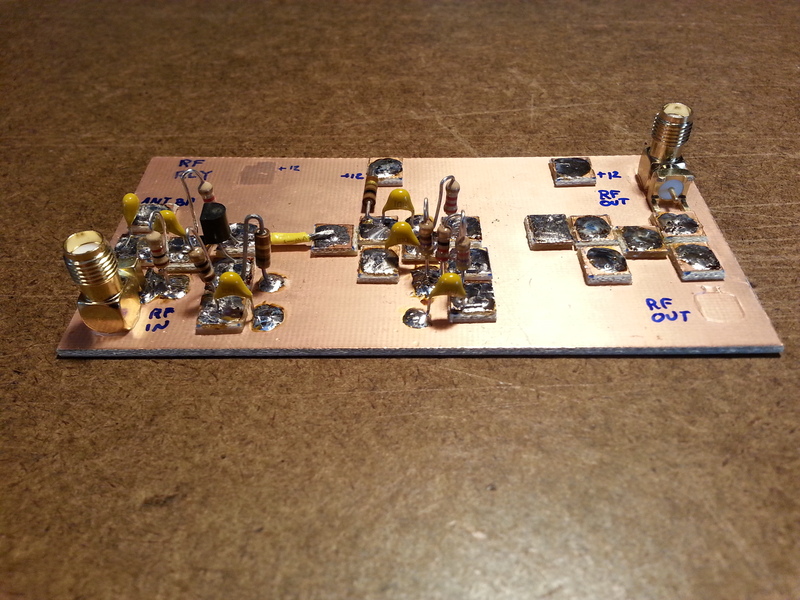 This is not a final solution, but it will work well enough to get this QRP DSB transceiver on the air for testing. 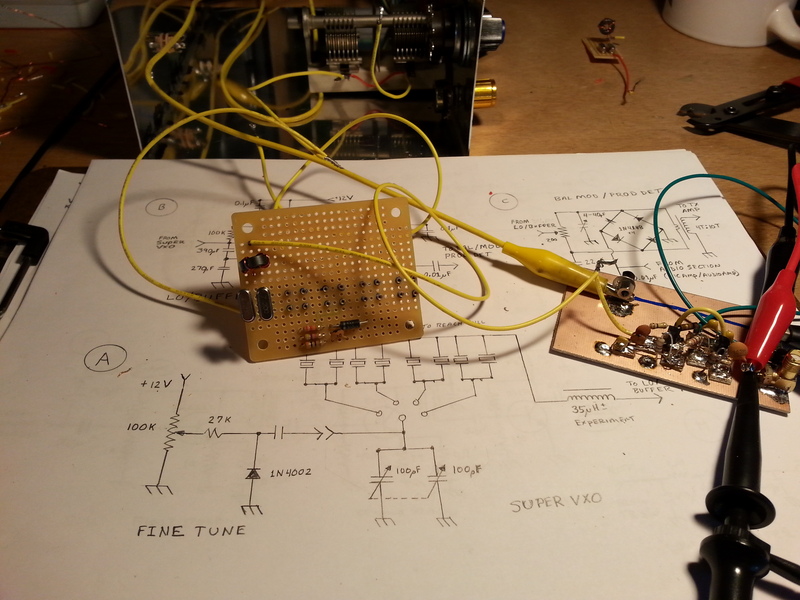 Of course now that I have a working VXO attached to the local oscillator buffer, it’s time to hook it up to the product detector/balanced modulator… success! With the VXO, buffer, product detector chain attached to an antenna it was time for a little listen. The audio amp still has some issues as far as power drain off when power is disconnected, but it does fine as an amp. I plugged everything together and plugged the audio out into an external amp so I could tune around without headphones. 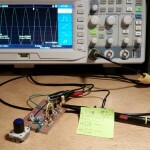 Not much on the band, but my frequency generator with a small antenna plugged into it put out enough RF for the receiver chain of the Beach 40 with the temporary VXO to pick up its 400 Hz signal and cross reference the VXO frequency displayed on the oscilloscope with that of the frequency counter connected to the frequency generator. So one could say I have a working receiver, mostly anyway. Next up: First and foremost I need to get my documentation in order. 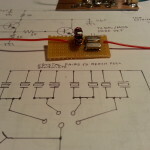 In particular, I need to get the schematics in conformance with the actual circuits. After I get the documentation in place I need to get to work on the audio amp. 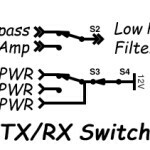 After the RX stage is all dandy, my attention will turn to the TX/RX switching. 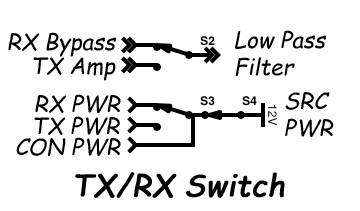 I can’t do anything more with the TX side until I get the TX/RX switching squared away. Anyway, that’s all for now. To keep domestic peace I have not been building on the Beach 40 non-stop as I might otherwise do and there is a side benefit… By taking some time away from the build I can clear out the cobwebs and refocus on the greater project to check my thinking and my work. I still need to do testing on a few of the sections. However I have all but two sections assembled with only minor followups. 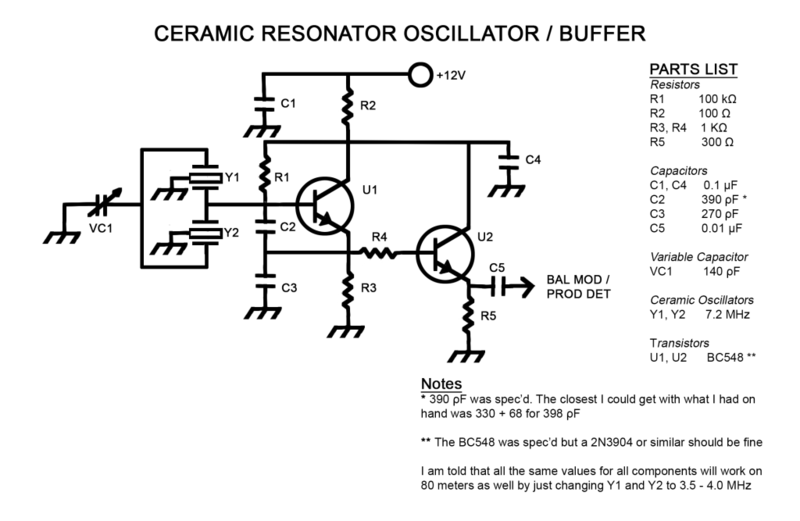 I need to figure out the value of the common emitter voltage limiting resistor on the Audio Amp and I need to wined and connect the two bifilar toroids in the RF Amp. 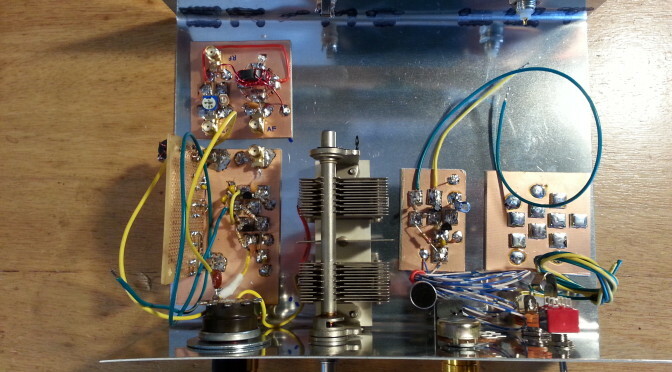 The last two sections to build are the Low Pass Filter and the T/R Switching sections. The bit that I have been burning cycles on is the T/R Switch. I want to do something that consumes the least power overall at-rest, something basic and bulletproof. Once I have the relays I will draw up a new schematic for this section and get it posted on the project page. While not working on the Beach 40, I did do some radio stuff. I picked up some parts for stock from Jameco one day, a bag of varactor diodes, then two days later went back to pick up voltage regulators, a bag each of 5, 9, and 12 volts. The XYL went with me to a local Radio Shack that is closing down. 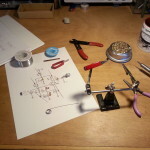 We picked up a bunch of zener diodes, a pair of bridge rectifiers, and some mechanical connections at 80% off. There wasn’t much left to pick through. 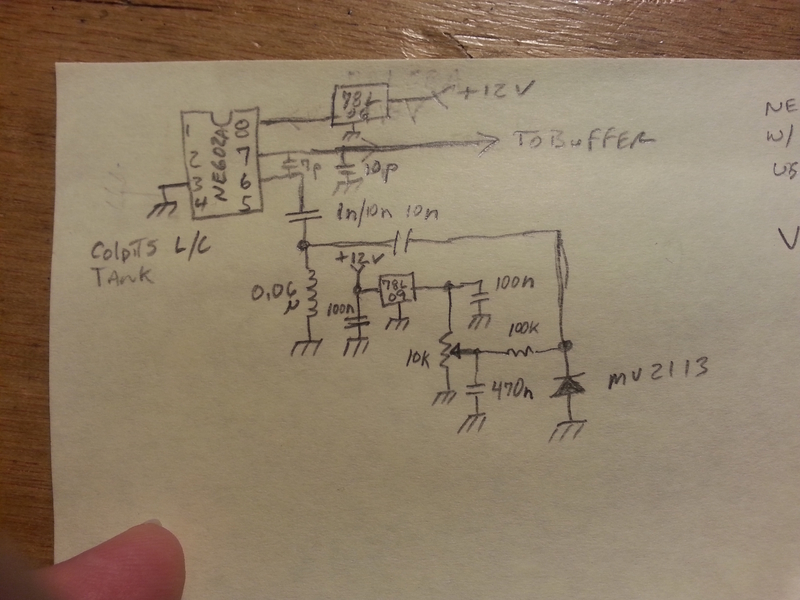 I also found a pair of NO SPST relays which got me thinking more about the previously mentioned T/R switching circuit. 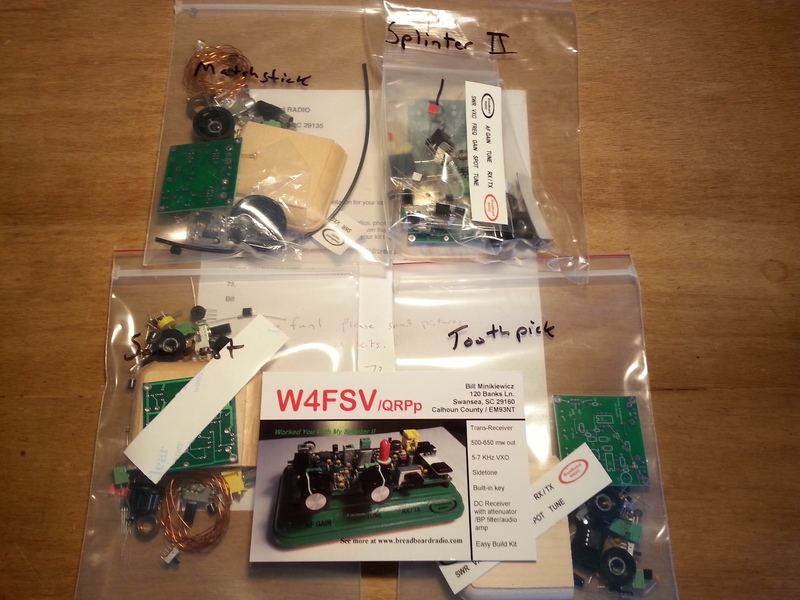 I also ordered a few bags of various op amp transistors that are frequently used in radio circuits. Purely a stock order, and I’m pleased to say the parts bins are slowly filling up and I am getting to the point I think I could actually build my next radio without going out and buying any parts. This is a good thing and I’m fairly certain my wife will agree. Also radio, not Beach 40, the beginnings of research on VFOs. I have been looking at a lot of material on VFOs without finding what I am looking for. 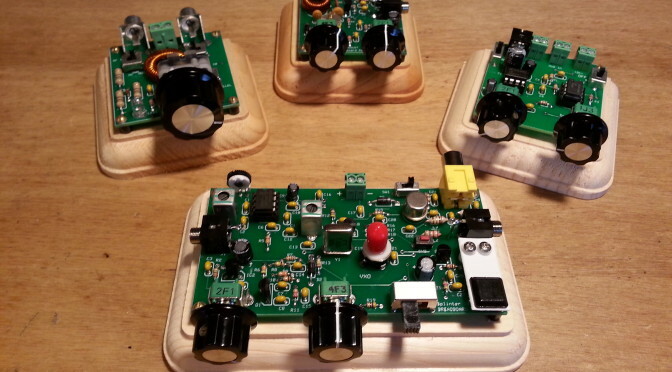 I want something small physically, low power consumption, as close to all discrete components as possible, all readily available parts, stable, and a wide tuning range. A tall order I think. An Experiments page has been set up to keep a log of these kinds of long-term projects. I haven’t created the page for the VFO research yet but that will be up shortly after I update the Beach 40 build page. One other non-radio, well mostly, is the slow planned migration to Linux. I have been wanting to this for a long time but the last time I tried it wasn’t so well planned. This time I am running both Linux (Ubuntu) and Windows (8.0) side-by-side rather than one virtual. It will be a long protracted process this time but it should result in a much better transition. Before moving on to Beach 40 progress, I got something else in the mail. 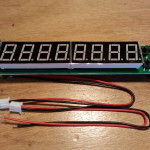 A frequency counter module I ordered off eBay for ten bucks. 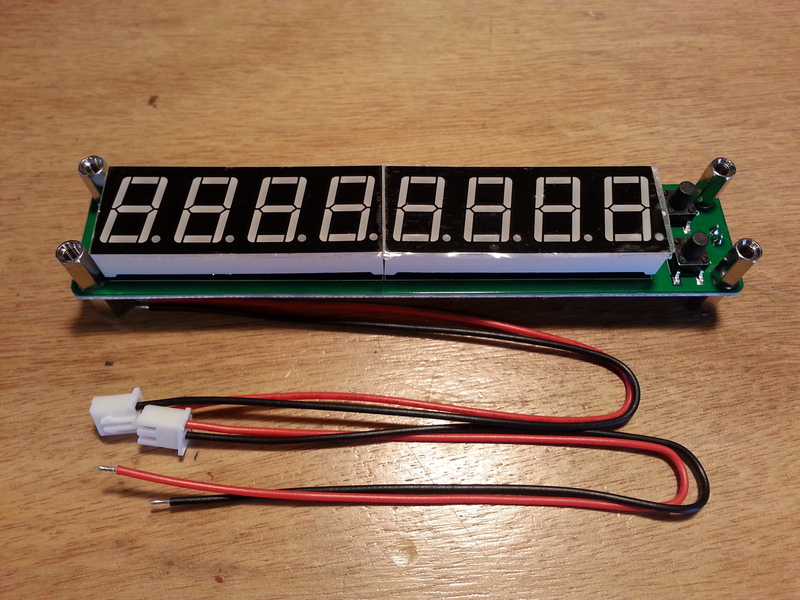 I am thinking about using it in a future radio project as a digital frequency display. Not sure what project, but it beckoned to me and I figured it might work out well. In a related sidebar, I have been doing some VFO research. 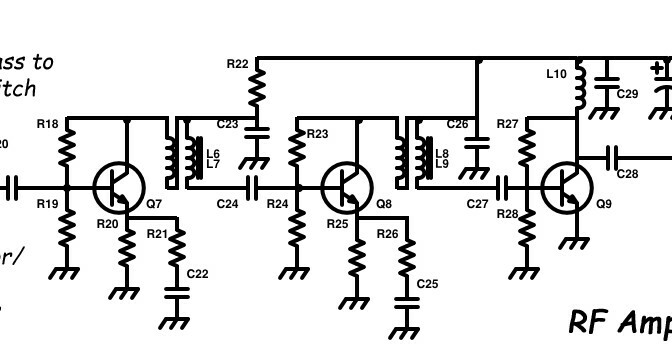 I have been looking at several options and one that seems simple and efficient is using varactor diodes to replace the air dielectric capacitors in tuning circuits. 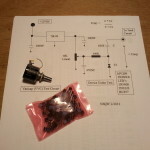 I have some ten-turn potentiometers and found a good deal on Motorola 68ρF varactors so I bought a bag of 100. 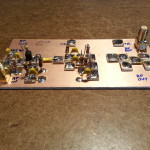 I found N6QW’s website with some great information including a test circuit for testing the tuning abilities of various diodes and transistors. Definitely more to come on this venture after the DSB project is done. 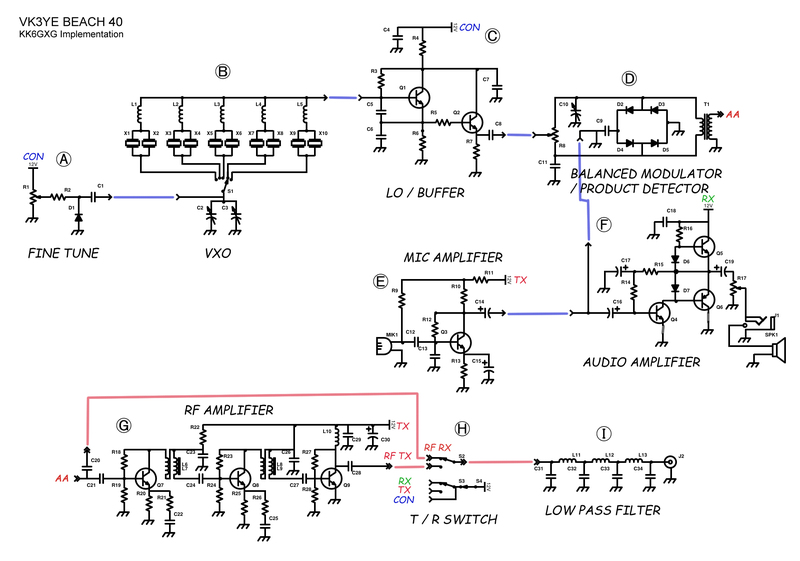 In the last post I talked about skipping the Balanced Modulator/Product Detector and moving on to the Audio Amplifier. I built the Audio Amp and got everything all tied in to the panel mount components. I still haven’t tested the Audio Amp yet and I am saving that for after I get all of the sections built out. 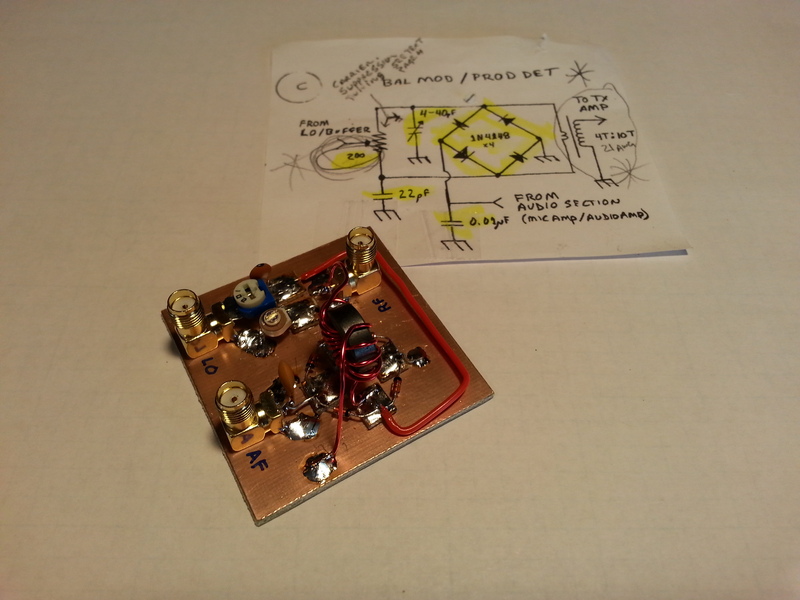 About the time I finished up the Audio Amp the 200Ω potentiometer I was waiting on showed up. With the parts in hand, I moved on to the BM/PD. The BM/PD build went well. with no real surprises. 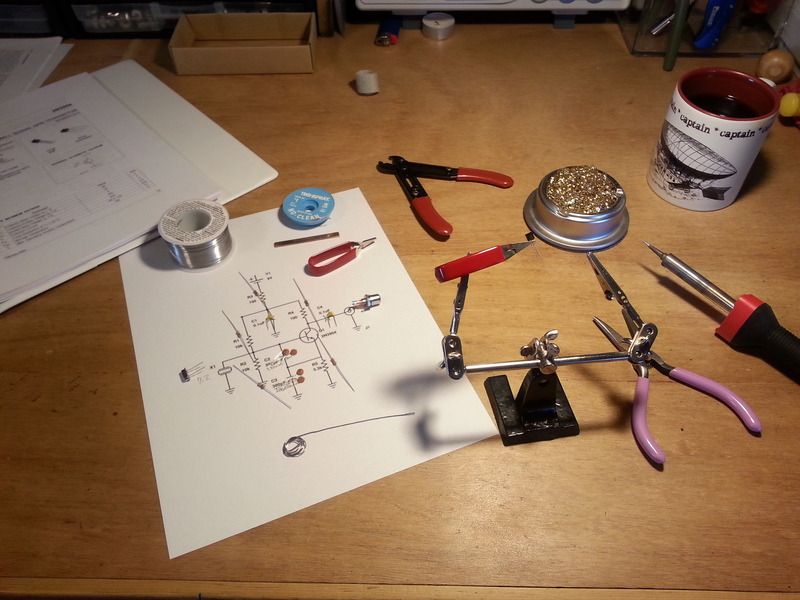 The diode ring ended up being laid out in an actual ring configuration with the RF transformer being mounted right in the middle. The one thing I don’t like about this layout is the really long lead from one side of the diode ring all the way around to the other side of the board to the potentiometer. I don’t know if I can come up with a better layout in a future rendition but for now it should be fine. 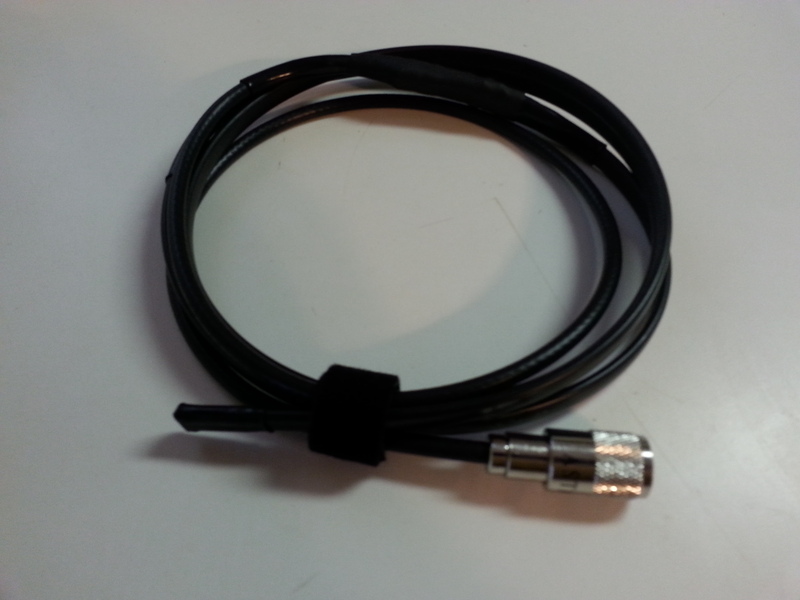 One of the first things I started with today was building the interconnect cables out of RG174 coaxial cable and SMA connectors. 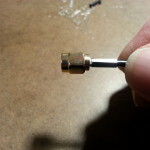 I considered MMX connectors since they just push on rather than thread on but they are way expensive. I have seen a number of builders use coax interconnects for modularized construction and it makes separation for experimentation much easier. 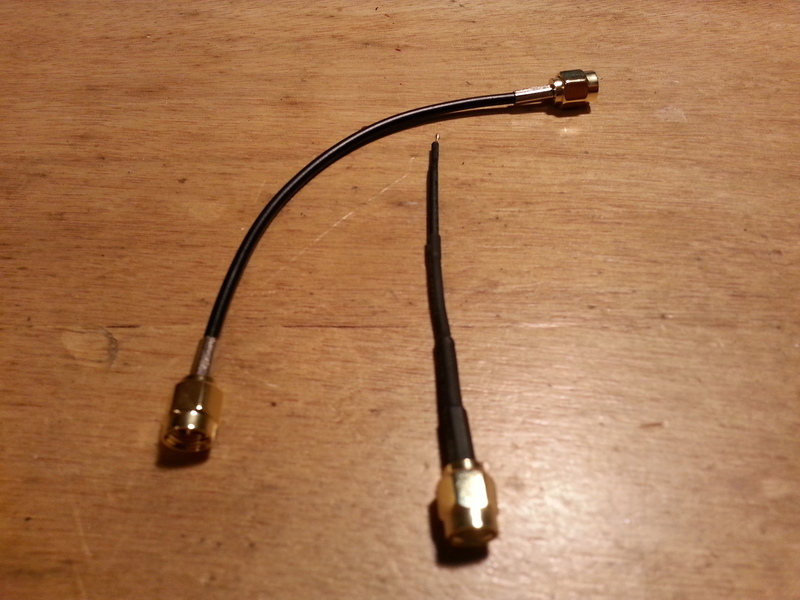 One cable I made was actually an antenna, a test antenna at least. For testing transmission sections giving them something to radiate out of. 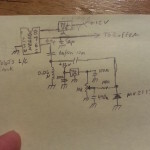 By using a receiver near the transmitting device I should be able to copy the transmission. It’s the one on the right if you hadn’t guessed. Cables, of any kind, are one of those things that can seem fairly easy to do, but when they go bad, they can go epicly bad and it can be hard to detect. The only preventative effort I know of is to take your time, use a light touch, don’t force things, and pay attention to detail. 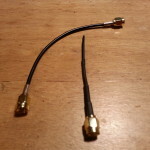 I made 4 interconnects, 1 antenna, and one single end cable for connecting to the antenna outlet. It took a coupe of hours, but all of them are solid mechanically, and test to be solid electrically. 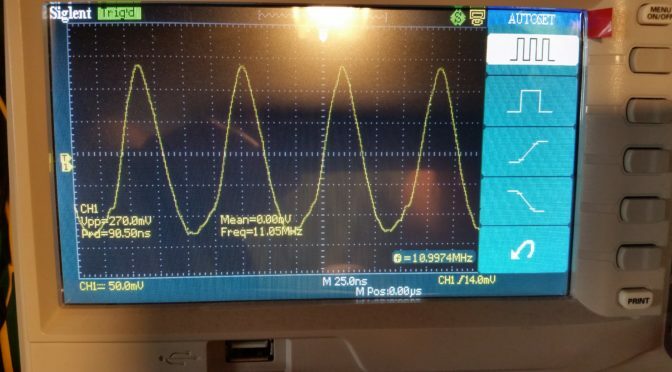 After getting the cables done, I hooked up the antenna and one of the interconnects but I still haven’t done any of testing beyond the Local Oscillator. I have a lot of testing to do but I’m almost done with the modules so I wanted to plug away and finish up the modules. 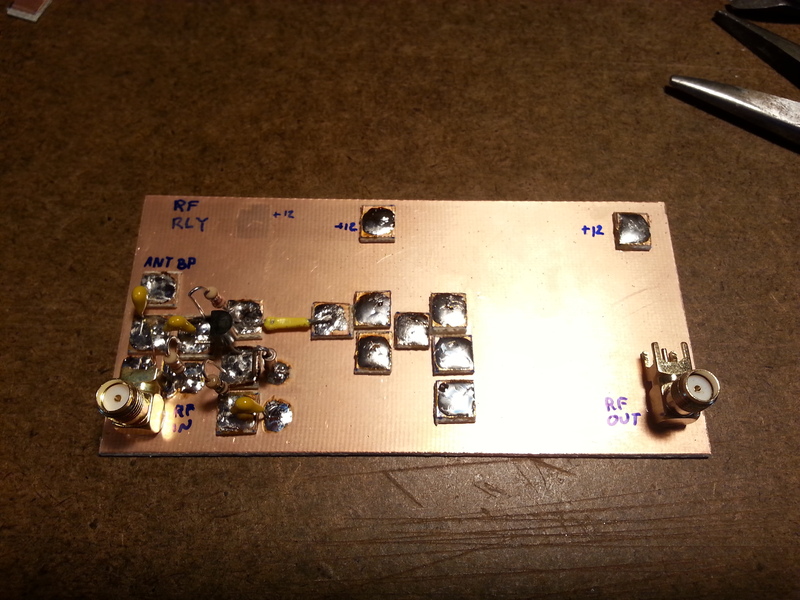 The last thing I worked on before turning off the soldering iron was the three stage RF Amplifier. The pic is the first stage, a buffer stage. I started the board with a configuration in mind but by the time I got to the third stage I had shifted a few things around. One thing I wanted to point out is the spacing of the stages. In this pic I have most of the second stage done and the pads for the third stage laid down. The gaps between stages are for the addition, if needed, of shielding between the stages. This amp is fairly low power so I don’t think it will need the shielding, But I wanted to make the option available. The third stage saw several pads moved and things reconfigured a little. The yellow leads are the RX Amp Bypass (short lead) and Amplified RF (long lead) lines going to the relay circuit which after a lot of thought this evening will be replaced with cable ports and the relay section will be moved off this board entirely onto it’s own module. The other bit on the RF Amp board that still needs work are the two bifilar toroids that still need to be wound and installed. It sounds like a lot of work still to be done, but it is getting very close to First Contact. Thats all for this post. May the magic smoke remain contained in all your circuits. A lot going on these days. Lets start with something educational… No, don’t run away… it’s not that bad. RTFM or Read The Freaking Manual is directed in this case to datasheets for semiconductors. And this is where we begin our lesson for today. 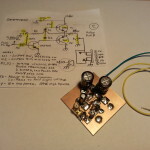 I have been working on the Beach 40 project for a few weeks now and have made some progress but I was having some difficulty with the VXO (variable crystal oscillator) and the LO/Buffer (local oscillator and buffer.) 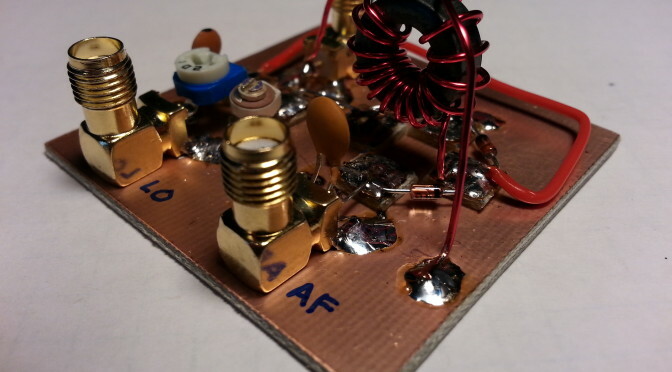 The oscillator section is supposed to generate an RF carrier frequency, in this case close to 7.2 MHz. I wasn’t generating the carrier and I couldn’t figure out why. I decided to put these sections aside and move on to the next section and ruminate on the problem for a while. 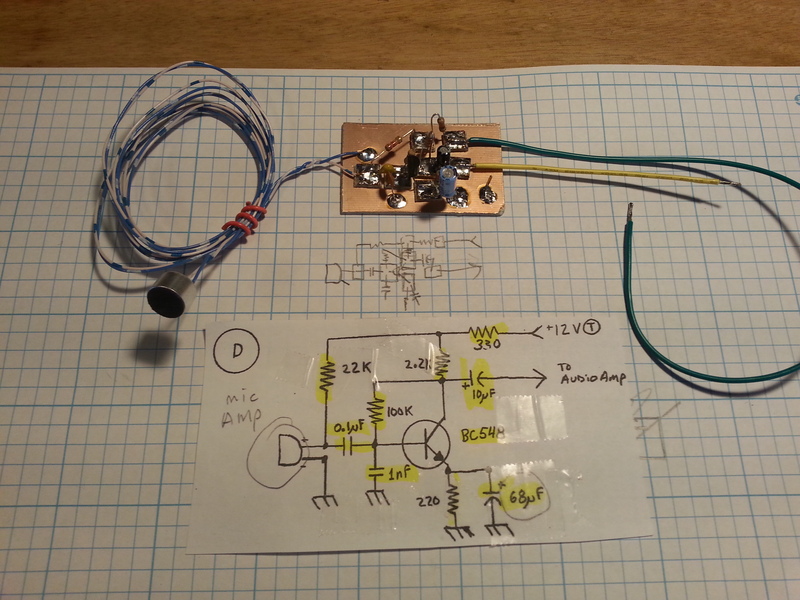 The next section in line was the Balanced Mixer / Product Detector but I was missing a component that I was still waiting to arrive, so on to the next stage, the Microphone Amplifier. Laying out the parts physical locations on the circuit board I came to the transistor, one I hadn’t worked with before. So I decided to look up the data sheet and be sure of the pin-out. It wasn’t what I was expecting it to be, and then it hit me, like a Log from BLAMO! 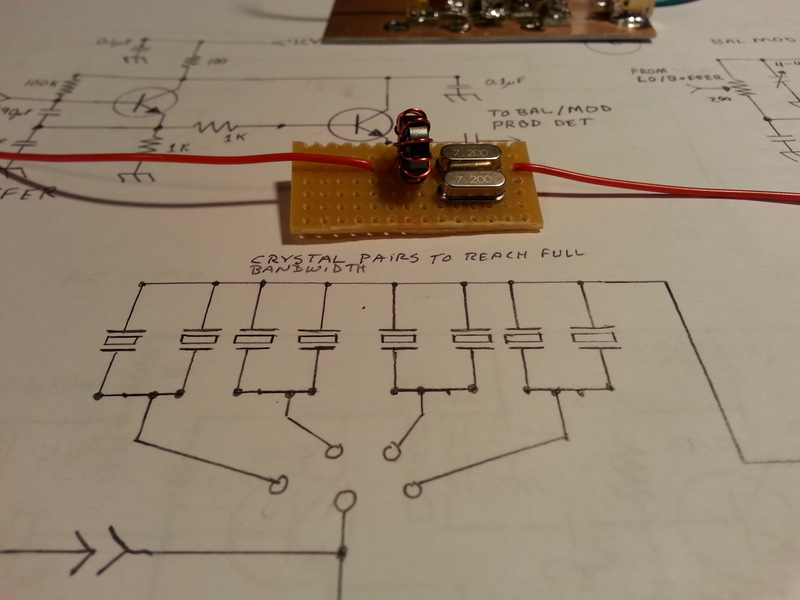 My oscillator wasn’t oscillating because I had the pinout wrong on the transistors! 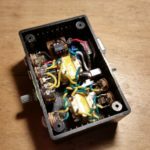 I finished the Mic Amp and the part arrived for the BM/PD. The Balanced Mixer/ Product Detector. Ain’t she a beaut! I moved on to the BM/PD and finished it then looked up the transistors on the LO/Buffer and sure enough, I had them in backwards. 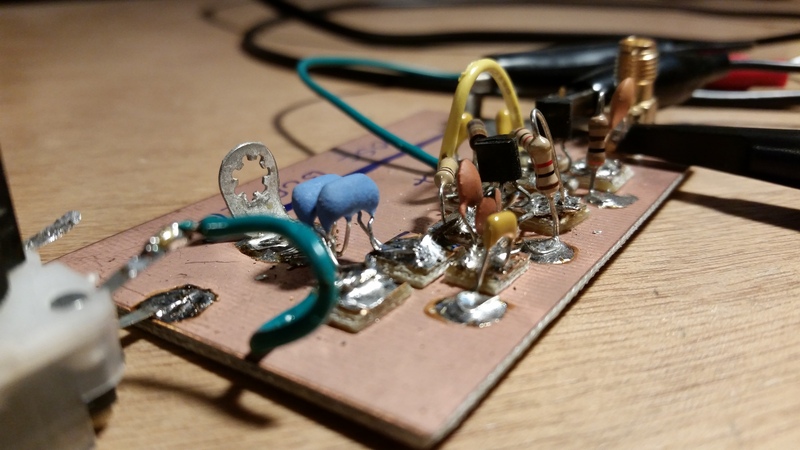 With a little coaxing and cajoling, and construction of a really scaled down crystal oscillator for testing, I got them turned around and everything back in place, well sort of. I missed a jumper and had to go back and solder that back down, but the after that the oscillator was oscillating like a good little oscillator should. Oscillation! 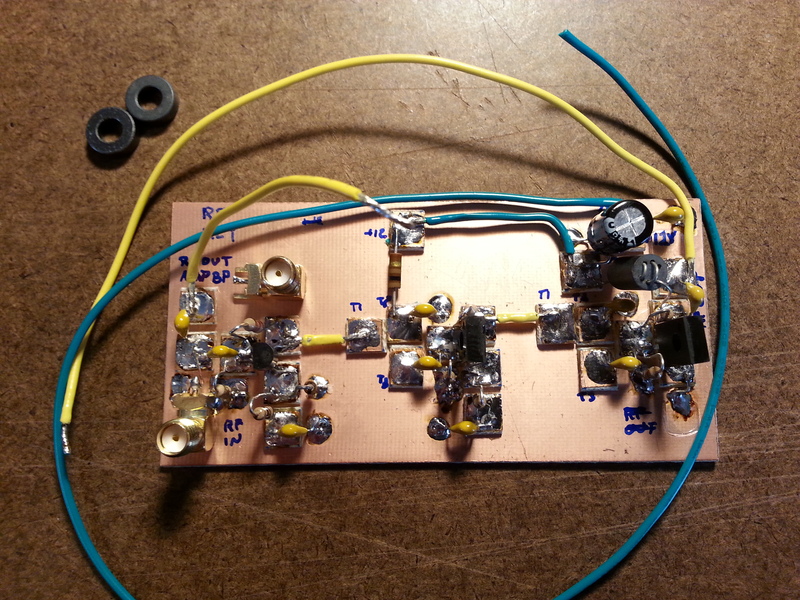 With a little tweaking and and the removal of the Fine Tuning circuit that I still haven’t figured out, I am back on track and only three sections shy of a full transceiver. 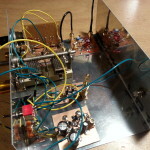 At present I have the sections built for a QRPpp transmitter a very, very, very, very low power transmitter, somewhere around the microwatt range but I should be able to modulate a voice transmission a foot or so to my DC receiver. 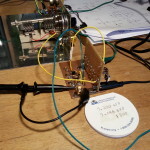 The Mic Amp test is actually a test of the VXO, LO/Buffer, Balanced Mixer, and Mic Amp sections and has me transmitting some AF (audio frequency) along with the carrier through the Balanced Mixer to help locate the signal in the band. Once I locate the signal on a separate receiver it’s time to tune out, or “suppress”, the carrier signal on the BM/PD section. I’ll be doing just that in the next few days. Hopefully I will remember to video the test and post the video. I already checked out the VXO and LO/Buffer when I checked the frequency. I can check the Mic Amp just by hooking it up to a speaker, which I will. Then the BM/PD gets it’s big on-air check out. 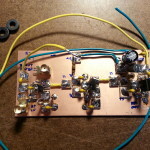 All that’s left to have a working receiver is building the Audio Amplifier which I have already laid out, I just need to solder the parts down and test. 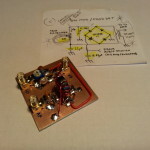 After that I need to build the RF Amp to have a transmitter. 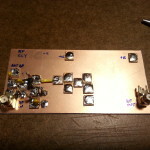 I will want to also complete the Low Pass Filter before transmitting though. I don’t want to splatter the band or anything. 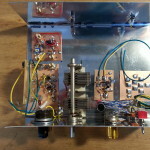 So the schedule for now looks like a completed Beach 40 transceiver should be on the bench next weekend or there abouts. When I first started this blog I planned on posting a separate page for each project I did. After some thinking on the matter I decided that scratch-built projects would have a page dedicated to them. The last post was an example of a project while important and interesting, I don’t think it rated a page. 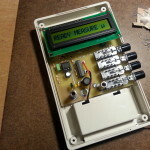 I am of course referring to the post on the AADE L/C Meter IIB. Part of the reason I’m not devoting a page to the project is that it is a kit, a great kit, but still a kit. Don’t get me wrong on this, kits can be a really useful tool. 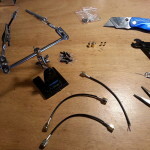 Often times kits can cost less that the parts purchased individually. They can also be useful in overcoming sourcing issues. 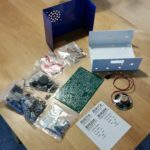 For the beginning builder kits are a great way to get your feet wet and try the building process as well as exercising the construction skills needed in scratch-building. A kit can get you on-the-air faster than scratch-built as well. 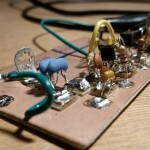 Kits give a potential scratch-builder a chance to see if they actually like building. Kits also offer a choice for the builder. 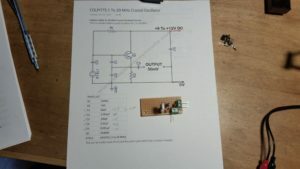 The kit can be built by just filling up the board following the instructions, or if you are looking at going scratch-built later on, taking the time to trace things out and compare the schematic with the board layout, and understanding what components perform what function along with how and why things are placed as they are goes a long way in improving your understanding of the circuit. While kits can be a good learning tool or refresher for the builder, they off-load a lot of the mental gymnastics involved in design, sourcing, layout, placement, and proximity matters. Or at least they should, a poorly designed kit can be a real challenge for even the most skilled builders. I decided to post about kits rather than page them because of this off-loading. While the kit may be of educational value, it is the mental exercise not the physical work that provides the real educational benefit. I don’t think I would be bringing much to the table beyond the instructions that come with the kit. So don’t be surprised when you see a project as a post rather than a page. 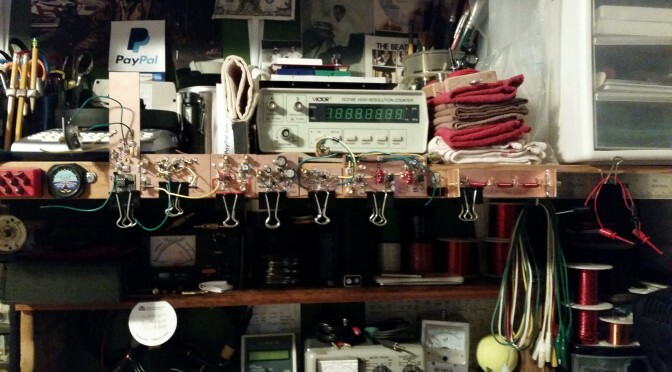 I will start the trend in my next post when I show off the BreadboardRadio.com kits I built before beginning my 40 meter Direct Conversion receiver. 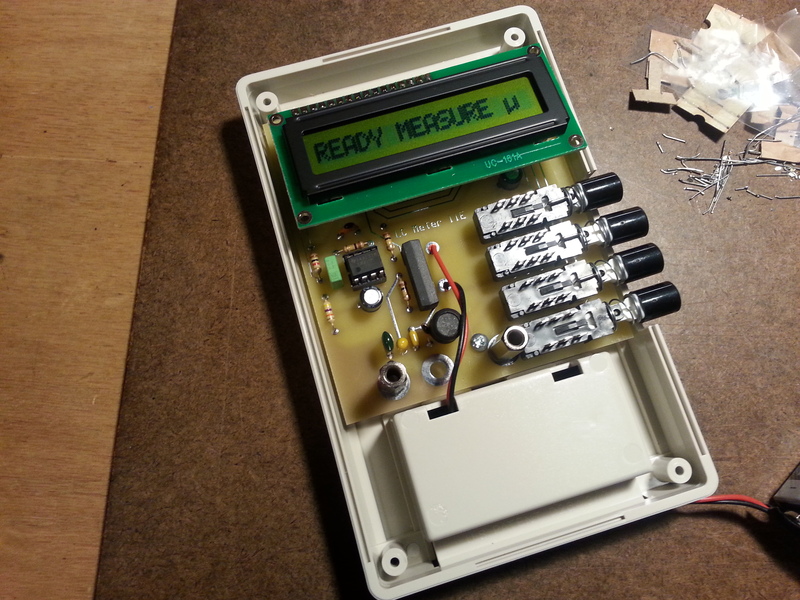 I will likely set up a Kits page as an index to kit projects if it looks like I need one. Back to building! 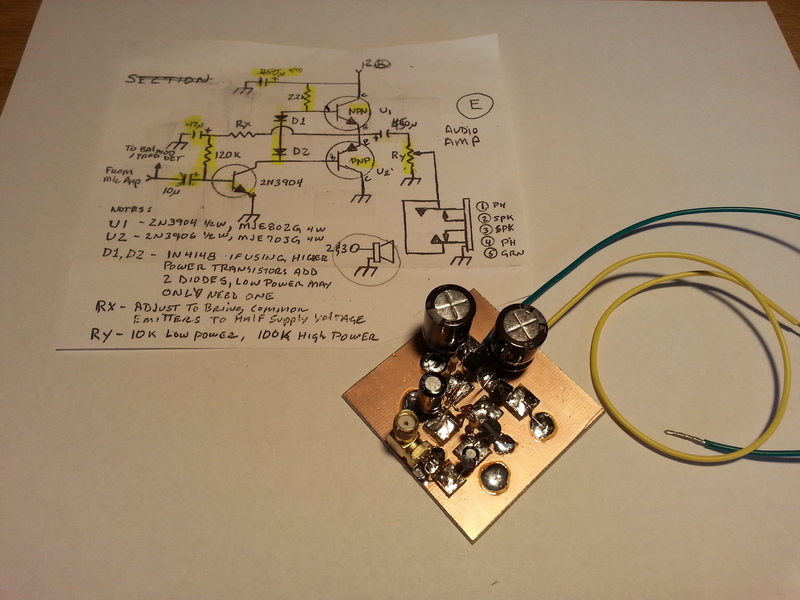 I finalized the drawings for my implementation of VK3YE’s Beach 40 DSB Transceiver. I created a project page for it here. I also finished the the “final” version of the diagram, at least until I get the physical build under way. I will be updating the diagram on the project page but not here so if you are interested in this project, check out the build page. 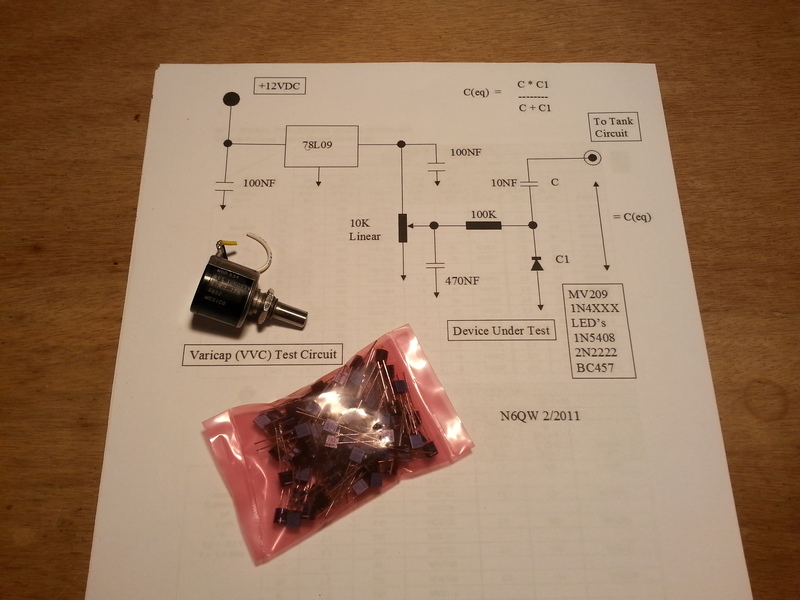 While I am heating up the soldering iron tonight, another important part of this project is the documentation. Not only am I going to be updating the project page as the build progresses I will also be keeping a lab journal. This is something new for me. I have never been skilled at keeping lab notes. 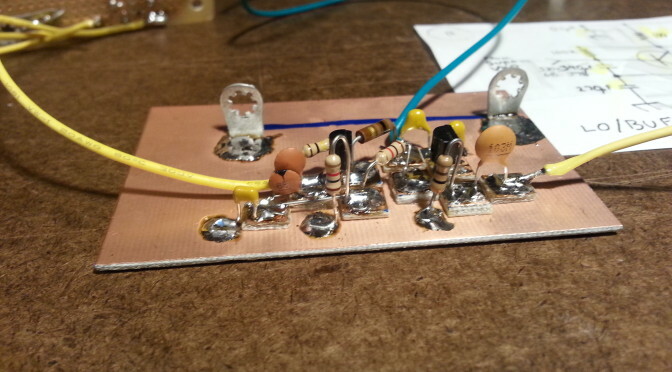 This is something I need to work on now that I am getting more involved in RF electronics as an experimenter. That’s it for now. More to come.